As you may know, I’m not normally a meal planner. I like to cook by the seat of my pants and just make what speaks to me on that day. I’m the same way with my blog posts too. I rarely know what I’m blogging about until I sit down to write and I don’t often plan specific posts ahead of time. I usually just sit down and type! It feels more natural to me when I don’t force something. …and that’s the same way I like to cook, but sometimes I need to plan meals to get out of a cooking slump. Now that I am on the road to recovery with this flu, I decided to plan out my meals this week and bid my cooking slump farewell! Don’t be fooled by this simple looking list- it actually took me over an hour to figure out what I wanted to make for the week. Also, I don’t like to specify what day I’m making each recipe! I will decide the night before most likely. :) I think the thing I love about planned dinner recipes is that you automatically have a lunch ready for you the next day! After I picked out my meals for the week, I checked what ingredients I had in stock and then I went grocery shopping for the rest. After meal planning and grocery shopping, I did prep work by slicing veggies (cucumbers, carrots, peppers) cooking grains and beans (chickpeas and brown rice), and made a fresh batch of Spring Fever Lemon Dill Hummus. This whole process took up half the day, but I’m hoping that it will pay off with time savings throughout the week. Keeping my May veggie goals in mind, breakfast today was a yummy Green Monster blended with 1 cup frozen kale, 1.25 cups soy milk, 1 large frozen banana, pinch or two of cinnamon, Vega Choc-o-lot protein powder, and Amazing Grass wheatgrass powder. I topped it with almond butter, cacao nibs, and 1/2 an Endure Glo Bar. It was delish…but gave me goosebumps! I had cucumbers and carrots with Spring Fever Lemon Dill Hummus, along with sprouted grain open-faced, toasted sandwiches topped with tomato paste, avocado, and pepper. I love this voluminous lunch as it takes a long time to eat. Stay tuned for a great week of dinner recipes! That lunch looks divine! 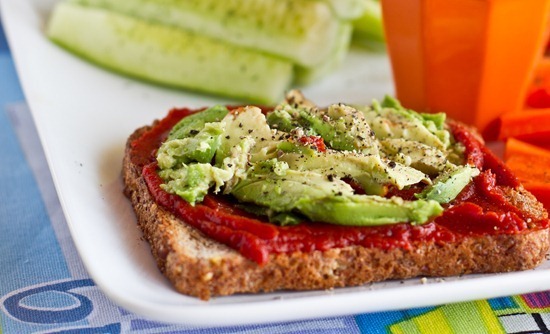 I love the idea of making open-faced sandwiches with tomato paste and avocado. I’m on a vegetable kick too, which will be so much easier when our gardens are going, don’t you think? yes I agree! Im sure my ‘plan’ will change up a bit here and there…but no big deal, right? You got cherries this time of year?!? haha I wish! That pic was taken last summer. 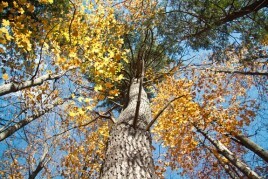 it IS dreary in southern ontario, today! glad you’re feeling inspired to plan out your recipes and meals again! “I usually just sit down and type! It feels more natural to me when I don’t force something. ” exactly! my favourite posts are the ones where i don’t try too hard…neat that you have found that, too! I do think it saves money too…good point! I had my first Green Monster this weekend and LOVED it. Do you normally make these with raw spinach or steamed? Raw gives me a stomach ache most of the time (and did this weekend)…is kale easier on the stomach? Any tips would be appreciated. Hope you’re feeling better! I get the same thing from raw spinach. I find kale too overpowering in the monster. I sub in chlorella instead. I make it with both raw spinach and raw kale. I used to steam my spinach (for better iron absorption) but I have stopped doing it simply to save time. Im not sure about either being hard on the stomach…I know that kale can ‘get things moving’ quite fast, more so than spinach. I find the taste of frozen kale much less bitter than fresh as well. I wish I was eating dinner at your house this week! Mmm your meal choices sound delicious! I like the idea of planning them out but not having a definite day assigned to each one. Less intimidating that way! You have some fancy meals to look forward to this week! So creative and all very different tastes. Oh my gosh, that salad. I know what I’m having for lunch. And the cherries! Yum! Can’t wait for all your recipes this week! Rainy days are my favorite! For some reason, I notice that too many sunny days seem to make me a bit depressed. Very strange, I know! 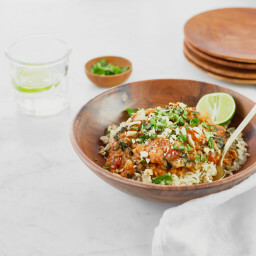 But I love your meal planning idea– I’m at my parents home, getting ready to go back to my place tomorrow– and I’ve been gone for two weeks, so meal planning is going to be essential! Thanks for your advice! Haha! I grew up in Southern Nevada, outside Las Vegas– so I loveeee rain:) I can’t stand the heat! I always have such a hard time meal planning! It’s something I’d like to get better at, as it’s easier to go grocery shopping (and stay in budget!) if I have a goal and a plan for what I want to make, but sometimes I just don’t know that far in advance what my tummy is going to want! Your meals sound delish! Im looking forward to them (as if i’ll be the one eating them lol)! I love how that open faced sandwich looks! Tomato paste + avocado sounds delicious! Menu looks awesome! I love menu planning but I’ve never actually done prep work along with the planning, I bet it really does save time! 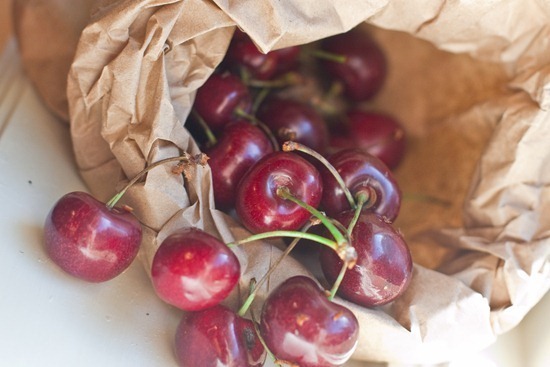 CHERRY SEASON MAKES ME SO HAPPY! I plan out 2-3 days of meals a week and the rest I just do ad hoc meals with what’s around the pantry/fridge. It helps me for sure. My hubby is willing to be more spontaneous, but that usually means less healthy foods. What kind of makeup do you buy? I need a better brand! Im not in love with it because my skin tends to be dry and it flakes on my skin. It is just ‘ok’ for my skin type. I really should start planning out my meals more. I usually end up with too much of something and not enough (or none) of something else when I go to cook. I like anything that makes healthy eating easier so I think a plan is a great first step. I can’t wait to hear about the root veggie fries! Unlike you, I LOVE meal planning (yes, weird I know!!) This week involves 2 fish dishes, and a lot of rice in various forms because I cleaned out my cupboards this weekend and I think I may have more rice than a small Chinese grocery store!! I planned my menus as well! That salad looks delicious. I need to get better about meal planning. For the first time in a long while I have an idea of what I want to make this week. Some weeks im a meal planner others I just wing it… I usually go by whats on sale at the store and then adapt or come up with recipes to make, a well stocked pantry is the key. 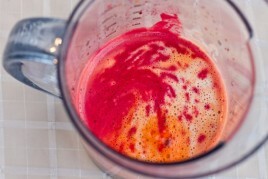 That smoothie looks delish as does your lunch with all those veggies hopefully you can kick your flu to the curb! I always try to meal plan, but I often find that by Wednesday I’m completely off track. I usually give in to my cravings and find myself at the grocery store 2 or 3 times per week to pick up some random item….that’s probably why my pantry is exploding with food all the time! Your lunch looks so amazing. I look avocado on sandwiches! I love meal planning! I feel like like it definitely saves me a lot of money and streamlines my cooking when I have a plan. I like to buy groceries for 5 or 6 nights worth of meals, but then I often change at least one or two to reflect my mood or what was good at the grocery store. I use it more as something to fall back on than something I MUST stick to. Oh and I usually buy way more produce than I need for my recipes. My desire not to let things go to waste will help encourage me to eat my veggies! Do you find that the chopped veggies stay fresh until Friday? I’d love to prep foods for lunch salads, but I feel like the veggies get kind of mushy by Friday… Do you have a special way to store them? I store them in Pyrex glass dishes filled with water. I find that keeps them fresh a bit longer. I dont store cukes in water though b/c I’d worry they would get mushy. I’m not sure how long they last, but I would guess 4-5 days? Here’s hoping! In water! That is something I never thought of! I’ll be trying this asap. Thanks! Mmmm that’s my kind of lunch. The avocado toast looks delishhh! And I ask the same question as Amanda. How do you store chopped veggies so they don’t go bad by the end of the week? Freeze them?? That’s the number one thing I love about healthy eating. You can have a giant meal of vegetables with some grains on the side, and you feel full after eating far less calories than any restaurant meal. I have a big appetite, and healthy eating allows me to satisfy that on minimal calories! That lemon dill hummus looks amazing – I’m going to make that this week! All your meals sound amazing! 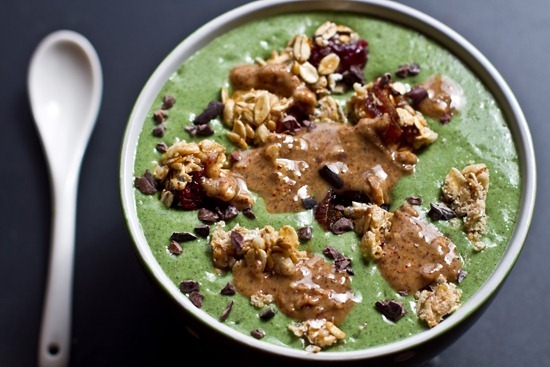 Your breakfast—kale green monster oh wow! only you and your readers(me) would think that looks INCREDIBLE!! hehe. Have a great day! I’m always confused when people don’t meal plan, lol it’s such a habit for me! Otherwise, how do you go grocery shopping? What I buy totally depends on what I’ve planned to eat! I tend to get in food ruts, but buying new things forces me to try new meals! I do make lists…but only for the usual suspects and occasional recipes I have in mind. I always plan my meals and make a list.. but chopping veggies at the beginning of the week is something I did not think of! That would be a HUGE time saver in the middle of the week. I REALLY like this idea! i think you are the only person i’ve ever seen eat toast with tomato paste…youre taste buds are usually spot on so I have a feeling I should give this a try! do you and eric ever eat out? just curious what kinds of restaurants you all go to when you do go out. We don’t go out to eat often because there aren’t any restaurants in our town, and the ones nearby are mostly chains. :( I do have a fav Italian restaurant though. Glad you are on the mend. Happy planning!!!! Meal planning is the best, because then you know what you’re going to buy at the superstore, AND you can look forward to that certain delicious meal (oh, and not having to spend hours preparing it the day off when you’re as ravenous as the cookie monster also helps too ;) )! Speaking of meals though, I think it’d be wonderful if maybe a few days before Mother’s Day you could possibly make a post on a Mother’s Day brunch or meal (dinner + desert)? I’m celebrating Mother’s Day one day early because my sister has a dance competition Sunday, so we won’t be able to make her the usual french toast in the morning. I really wanted to make a delightful vegan dinner with desert, but so far it’s been difficult finding something so elegant and traditional for the holiday! i want to copy that lunch. yummm. i try to plan a few dinners and try to shop once/week on sundays. breakfast and lunch are similar or I always have the ingredients on hand, so dinners are the only tricky one for me. I love lunches that take a long time to eat. All the slow crunching makes the process satisfying and filling. Your open-faced sammy looks great. Lately I have been on such a carrot loving kick that I can’t put anything (hummus or pb) on them, because I just want to taste carrot. I have got to make more veggie and/or bean burgers. They are sooo good. Thankyou, I sometimes find menu planning a little overwhelming and like to just make what I feel like as well but your meal plan for this week looks so good that I might follow it too! When I lived in the city I went to the grocery store everyday since it was a 3 minute walk away. Now, I tend to meal plan for 5 days in advance. Part of this is the convenience of having everything handy, but it also keeps me on track and away from the more unhealthy cravings. I love kale! However, I am not a fan of it in smoothies. Do you find that it takes over the taste of your green monsters? Or do the other additions balance the taste out for you? It was zero here on the west coast yesterday morning. I hear you on the goosebumps! Sticking with the oatmeal for a few weeks more. Normally I do find the taste is over powering, but I recently bought frozen kale and I dont taste the bitter taste anymore. Weird! My mom and I plan all our dinners for the week on Saturday or Sunday so that we only have to go shopping once during the week. It actually works out really well and what ever we feel like having out of the chosen meals on a certain night…that’s what we have. Your menu looks delicious! I am really wanting some enchiladas right now! Do you have a recipe for those?!? You had me at Creamy Sweet Potato Bake, I can’t wait to see the results from this!! Your green monster looks unbelievable! I have recently gotten on the meal planning train and I’ve realized a few things: 1) It’s so much easier to eat more healthfully 2) I’m so much more organized! 3) I save a lot of time and money at the grocery store! Funny – I had a nearly identical breakfast this morning, but in a glass! I am going to have to try that avocado open face yummy looking sandwich. WOW. I love avacado and I feel like I have tried everything but this looks delicious. Thank you for sharing. I try and be a meal planner but it is so time consuming. It makes the morning’s less stressful but really takes a lot out of me. :) I do agree though, meal planning does inspire great cooking. Voluminous lunches and foods? Yes I love them! They take awhile to eat, they are usually fiber filled and have lots of chew and texture. Always good. Meal planning and groc shopping accordingly…you are on top of it! You go girl! It saves time, money, and is healthier for sure in the long run when you can meal plan I find. Yum I want to come over for dinner every night! Will you be posting the recipes? 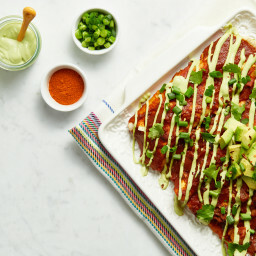 Because I’ve been dying for enchiladas and want a good recipe! I love that there’s so much veggie in here–I’ve been eating lots of beets and veggies, and my stomach is so much more at ease than when I don’t. :) can’t wait for the post! Looking forward to the dinner post. 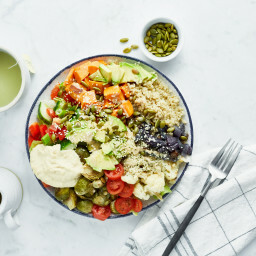 I think I am going to try that for lunch, love all the veges. Looking for a good cornbread recipe, any suggestions? I wish I could be more of a meal planner but I too like to fly by the seat of pants :) I must say I’m intrigued by the creamy sweet potato bake and biscuits ? 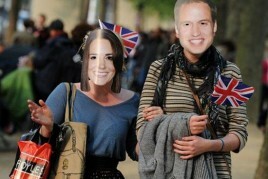 I do hope we see this in the future :) I’m a southern girl and the very mention of biscuits makes my ears perk up! Wow, I thought I came up with the tomato paste, hummus, avocado combo. 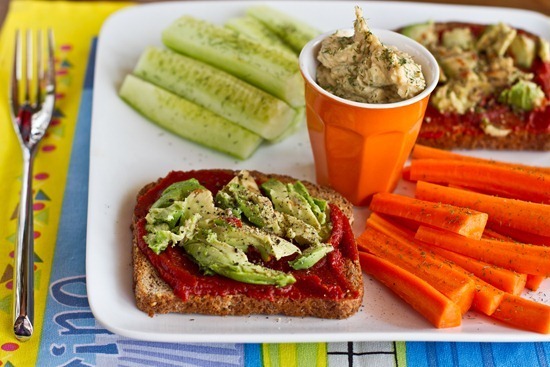 I was sure I was strange for liking to mix tomato paste and humus together and then dip or spread it onto steamed or raw broccoli tops. If you really smash it into the “leafy” part of the broccoli “tree” it makes for a very flavoful and texturally pleasing bite. Go Angela, good on you for being so positive about getting out of your slump. I always plan out my meals so i am organised through the week and i find it stops me from buying too much at the supermarket and more importantly stops me buying junk. Your menu for the week sounds incredible, hope your going to post the recipes! Those meals sound delicious! By the way, I tried my first Cherry VOO Bomb today….in fact I’m eating it right now. Sooo yummy! Thanks for all the amazing recipes. Those recipes sound amazing! Very excited to see how they turn out. I’m all about the meal planning- at the end of the day, I am out of creativity and just want food in my mouth immediately. Tonight I actually had a total OSG dinner- salad with the Better Than Bottled balsamic dressing, and the avocado pasta- which, let me just say- O.M.F.G. Delicious. Thank you as always for the inspiration! I would so love to be planning my weekly meals, but I find it hard to do with such little time. Not to mention, because it’s just me, I tend to eat the same thing several times during the week. One of my friends just suggested your blog to me and I’m already addicted. It’s really fantastic! I don’t always plan out every meal, but I plan one or two and then some staples that will make mealtime easy like dips and dressings for veggies. We love your better than balsamic dressing. 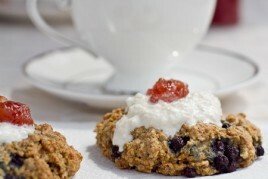 I’m amazed that you don’t plan your blog recipes! I’ve always been a planner – I write recipes daily, then send them to myself [via email] then grab 5-7 each week, print them out, shop, and cook! Meal planning is my savior! I get so busy in the week I barely have time to breath, let alone cook. Can’t wait for the sweet potato recipe as they are my fave right now! I just got offered the chance to help prep meals for basketball players who would be staying in my town and practicing at the gym (program run by hubby’s friend), since my hubby’s friend knows I love food and nutrition…so, I better get this meal planning thing in order! I love to meal plan but I think it’s more about the planning than the outcome for me – I rarely follow through on the meals. Sometimes it’s made more difficult because I don’t know how much it’ll make for leftovers, how much my boyfriend will eat, etc…plus I’m paranoid about food going bad so I don’t want to make too much at once..ANYWAY I hope yours work out well because they all sound delicious! I’m trying to plan my meals more often too. I’m I planner, I like to know what is coming next. I’d like to come over for at least 3 of those meals. Please. No, really…Please? Love the pictures, so pretty! That green monster looks scary :) Just kidding! It actually looks quite good! Those meals sound amazing! I am SO looking forward to the recipes. I have just started doing a better job of planning my meals for the week and I find it very helpful! It’s also forcing me to be more creative instead of just going to my standard fare week after week. mmmm that lunch sounds amazing!!!! The tomato/avocado combo sounds AMAZING! Your breakfasts always look so girly and cute! I’m such a huge fan of meal planning. It saves me time, energy, money and calories. 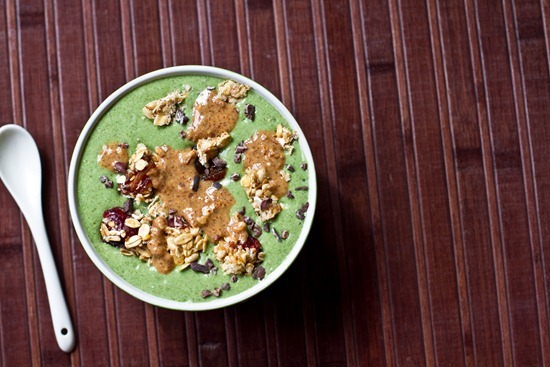 Your green monster looks delicious! If that doesn’t heal you…. I just LOVE your site! I love your positive energy and attitude towards nutrition. I am in college and sometimes struggle with healthy eating (sweets, especially anything chocolate, are my vice). Please tell me where I can find the recipes from this post! I want to make em all! Having a general idea but not truely defining which day I’l make a meal works so much better for me too. It’s awesome having a plan, but I like to play it by ear too. That lunch looks wonderful! I’m usually a meal planner, but I have definitely been slacking lately! All of those meals sound delicious! I don’t know how you do it, Angela. You never plan and yet, you manage to cook all those magnificient meals AND blog about them? Wow… do you have superpowers or something? I want me some of that! Me, I always have to plan AT LEAST a week in advance, sometimes even 2… Certain meals I need to get started the previous day, so I almost have to keep a schedule. 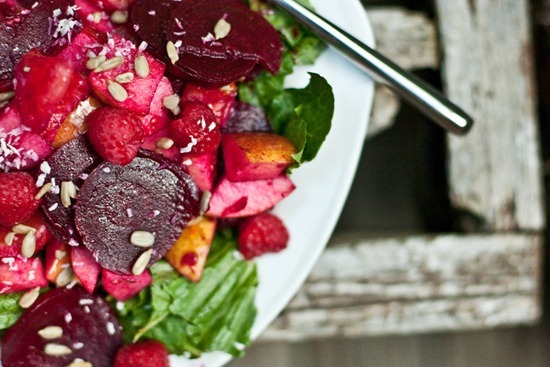 That beet salad looks absolutely fantastic by the way! Do you have the recipe somewhere on your blog? I agree– I don’t plan meals (nor does the rest of my family). Sometimes, if I want out of a rut, I’ll write down lots of ideas or just walk into the kitchen net day and be like: “I’m getting out of a breakfast rut, I’ll make muffins for everyone instead!”. Funny– I like to have a semblance of a plan in most other things, but I’m more flexible with cooking (not necessarily eating though– gottat eat when I’m hungry– otherwise you have one cranky girl!). Wow those meals sound so amazing! I think our current cravings are incredibly in sync right now. How long you store cooked food? I’m looking for meal plans(weight loss) for vegan and gluten free. Where is the Beet Salad Recipe Pictured above? Hey Chris, unfortunately I don’t have that recipe on the blog. If you happen to have The Oh She Glows Cookbook, there’s a recipe for my roasted beet salad with hazelnuts you might enjoy. I also have a recipe for my golden beet salad on the blog here if you’re interested: https://ohsheglo.ws/t I hope that helps!